​The Phoenix Panhellenic Woman of the Year award has been presented annually since 1972 to a Phoenix area National Panhellenic Conference sorority alumna who has exemplified the National Panhellenic Conference Mission and Creed. ​In good standing with her Phoenix Panhellenic Association member group. Each member group is encouraged to nominate an outstanding alumna for consideration to receive this prestigious honor, however, the applicant may not apply for the Panhellenic Woman of the Year Award if they are applying for Panhellenic Emerging Leader of the Year Award. Candidate Applications for Panhellenic Woman of the Year are due on March 4, 2019. 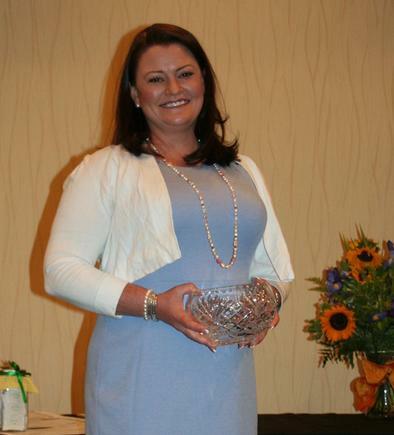 ​Phoenix Panhellenic Association Woman of the Year Award has been presented since 1972. Pictured is 2017 recipient Jennifer Lane ΑΧΩ. ​or complete the nomination form.